We’d love your help. Let us know what’s wrong with this preview of I Remember Beirut by Zeina Abirached. Abirached was born in Lebanon in 1981. She grew up in Beirut as fighting between Christians and Muslims divided the city streets. Follow her past cars riddled with bullet holes, into taxi cabs that travel where buses refuse to go, and on o Zeina Abirached, author of the award-winning graphic novel A Game for Swallows, returns with a powerful collection of wartime memories. To ask other readers questions about I Remember Beirut, please sign up. Wow. I'm not sure what I expected when I picked this up, but it wasn't this. I think maybe I was anticipating a more straightforward memoir, something more like Persepolis. There are some similarities, of course. 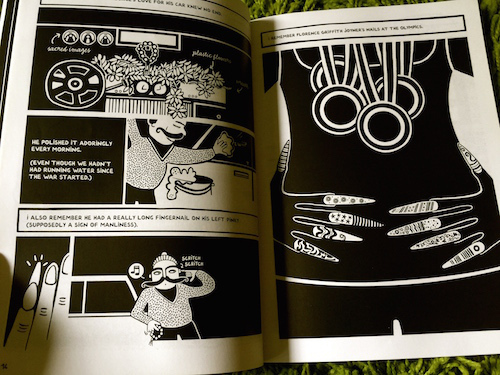 The visual style Abirached uses is visually rather similar to the one Satrapi uses in Persepolis. In my eyes, that's a compliment. I think Abirached's art is perhaps a little more simple, but that's hardly a bad thing. Both works tell the story of a childhood defined by unrest in their Wow. I'm not sure what I expected when I picked this up, but it wasn't this. I think maybe I was anticipating a more straightforward memoir, something more like Persepolis. There are some similarities, of course. The visual style Abirached uses is visually rather similar to the one Satrapi uses in Persepolis. In my eyes, that's a compliment. I think Abirached's art is perhaps a little more simple, but that's hardly a bad thing. Both works tell the story of a childhood defined by unrest in their homes: Satrapi grew up in Iran during the Islamic Revolution and a devastating war in Iraq, Abirached grew up in the middle of the civil war in Lebanon. After those relatively superficial similarities, Abirached takes an entirely different route in telling her story. After this point, the book spoke to me as art and memory of one of the most tumultuous times in human history. The Lebanese Civil War was for the Middle-East what The Seven Years War was for Europe in permanently changing things. In all the suffering and confusion we have this story of a Lebanese Christian family trying to make the best of a bad situation. While this ultimately is a short story it is beautiful in its delivery. Zeina Abirached chose an interesting angle for her memoir of the civil war in Beirut: instead of focusing on the politics or the chronology of the war, she illustrates the impact of the unrest on day-to-day life. From the school bus that won't come to her house, to her mom's bullet-ridden car, to her little brother's shrapnel collection, Abirached remembers it all. And her remembrances are a reminder to the rest of us of just how much most of us take for granted and how much we should be thankfu Zeina Abirached chose an interesting angle for her memoir of the civil war in Beirut: instead of focusing on the politics or the chronology of the war, she illustrates the impact of the unrest on day-to-day life. From the school bus that won't come to her house, to her mom's bullet-ridden car, to her little brother's shrapnel collection, Abirached remembers it all. And her remembrances are a reminder to the rest of us of just how much most of us take for granted and how much we should be thankful for. I enjoy Abirached's simple black-and-white illustrations. I especially like her letter O's, with dots in the middle; the curlicue hair she drew on herself, the macaroni-shaped hair she gave to her brother, and the interesting mustaches; and her illustration of Florence Griffith Joyner's Olympic nails. There were a few references I didn't get, but that's not necessarily a bad thing, because it spurred me to look them up and learn even more. Zeina Abirached uses graphic images to tell the tale of her childhood. It was a dark time then. Christians and Muslims were at war. It was a civil war that divided the city. She, her parents, and her brother are just trying to live a normal life during the war, but there are a lot of complications that they face. The school bus won’t come down her street, so she, her brother, and the neighbors have to be driven to school. They I received this book from NetGalley in exchange for an honest review. Zeina Abirached uses graphic images to tell the tale of her childhood. It was a dark time then. Christians and Muslims were at war. It was a civil war that divided the city. She, her parents, and her brother are just trying to live a normal life during the war, but there are a lot of complications that they face. The school bus won’t come down her street, so she, her brother, and the neighbors have to be driven to school. They don’t have running water. Their lives are anything but ordinary. If you are a fan of Persepolis, please read this book. Like Persepolis, I Remember Beirut tells the story of a young woman growing up in a tumultuous time. Although it seems like it is aimed more towards children and teens, anyone will be able to pick up the simple book and learn from it. I immediately picked this up after reading A Game for Swallows: To Die, to Leave, to Return and was just as amazed at Zeina's work in this "sequel". This is a beautifully, simplistic piece about growing up in Beirut during the Civil War. I've noticed many readers have pointed to it being unusual or unique for not being so political. But that's how war works for civilians and especially children. Life goes on, regardless of the violence around you. A child will think and act like a child regardle I immediately picked this up after reading A Game for Swallows: To Die, to Leave, to Return and was just as amazed at Zeina's work in this "sequel". This is a beautifully, simplistic piece about growing up in Beirut during the Civil War. I've noticed many readers have pointed to it being unusual or unique for not being so political. But that's how war works for civilians and especially children. Life goes on, regardless of the violence around you. A child will think and act like a child regardless of the politics of a country. As a parent, I am admirable of Zeina's parents and their (basically successful) attempts at creating a safe, "normal" childhood for their children. I will not lie when I say I was actually disappointed with this book. As this is being typed, I am taking a few courses regarding the history and culture of the Middle East and when I saw this book I thought "Hey, a graphic novel about one of the many skirmishes that took place there! This will enhance my world view!" This story may be biographical and supposedly about Beirut, but it tells the reader [b]nothing[/b] about the motives behind the war and attacks, the "player I will not lie when I say I was actually disappointed with this book. As this is being typed, I am taking a few courses regarding the history and culture of the Middle East and when I saw this book I thought "Hey, a graphic novel about one of the many skirmishes that took place there! This will enhance my world view!" This story may be biographical and supposedly about Beirut, but it tells the reader [b]nothing[/b] about the motives behind the war and attacks, the "players" (governments, factions, armies, resistances? What? ), the death toll or casualties, or even a timeline of the whole thing. It was basically a short story of the author's life and the war in Beirut just happened to occur, but it was only hinted at. It was actually written very optimistically and light-heartedly to the point that I thought "Was this war actually that bad, because I'm seeing nothing of the horrors that a conflict labeled a 'war' would typically bring". Apparently there was a conflict between Christians and Muslims that sparked this war. Nothing regarding religion was ever mentioned or hinted at. Honestly, it read like a slice of life story with a silly narrator. I closed the book learning nothing more than when I had first began reading it. Maybe for those who are well-versed in this conflict or perhaps have experienced it, this is a nice light in what may have been a trying and horrific time in their lives. For someone like me, a person who was curious enough about the subject matter to read it in hopes of educating herself on the ordeal, it didn't do anything but slightly annoy me at its lack of information. 'I Remember Beirut' by Zeina Abirached is her memoir of growing up in Beirut during the Christian and Muslim war in the 1980s. The art is fantastic, but I kind of wanted something more. Then again, she was just a child, so perhaps my expectations were a bit high. She talks about living in what the school thought was the neutral zone, so they had to be driven out of their neighborhood to a bus stop. Her brother collected shrapnel. There were blackouts and fuel shortages. Along the way, the family 'I Remember Beirut' by Zeina Abirached is her memoir of growing up in Beirut during the Christian and Muslim war in the 1980s. The art is fantastic, but I kind of wanted something more. Then again, she was just a child, so perhaps my expectations were a bit high. She talks about living in what the school thought was the neutral zone, so they had to be driven out of their neighborhood to a bus stop. Her brother collected shrapnel. There were blackouts and fuel shortages. Along the way, the family got to do normal family kinds of things. Life in a warzone isn't much fun and that's mostly the feeling you get here. But the artwork is stunning, and really why anyone should read this. It's black and white with clean lines and beautiful patterns. I love young Zeina's wavy hair, and the map with fish where water should be. It's really great and I'd like to see more graphic work by this author. A companion to A Game for Swallows, I Remember Beirut is a collection of memories. From one page to the next, Reina takes us through her childhood memoirs of the Lebanese Civil war through a series of “I remember” statements. These memoirs range from things she saw walking to school to the complex emotions of living in a war zone. The illustrations are beautiful, the storytelling is compelling, and new knowledge is learned on every page. Both of these books should be in your library. Told in a ser A companion to A Game for Swallows, I Remember Beirut is a collection of memories. From one page to the next, Reina takes us through her childhood memoirs of the Lebanese Civil war through a series of “I remember” statements. These memoirs range from things she saw walking to school to the complex emotions of living in a war zone. The illustrations are beautiful, the storytelling is compelling, and new knowledge is learned on every page. 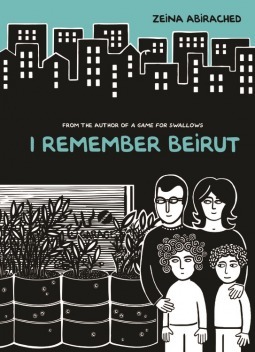 Told in a series of "I remember" statements, this graphic memoir takes you through a child's experiences in the Lebanese Civil War. Beautiful. Meh. The artwork was nice in this book. Other than that, it wasn't anything special. It doesn't give you any insight to the Lebanese civil war, or even to what it's like living in a war zone. It's a surprisingly optimistic book, and it doesn't really show the true horror of war. I definitely wouldn't recommend this book. This is like war-lite as far as reading goes. If you want children to read about war in a positive manner and with not a lot of disturbing images or thoughts, then this is the book for you. Also, if you are a fan of stream of consciousness writing, this is the book for you. If you want deeper explanations, more realistic overviews, or what is what...that will not be found here. A great addition to the genre of memoir and comic book. With an art style that is reminiscent of the culture but that is still approachable. And the simple "I remember..." style that says just enough about the experience of being a child and in the middle of a violent conflict. Zeina Abirached uses graphic images to tell her story about growing up in war-torn Beirut during the 1980s. Focusing on war’s impact, Abirached provides the reader with glimpses of every-day life and the effect war has on the ordinary citizen. From the water and electricity shortage, to the road closures, to her mom's bullet-ridden navy blue Renault, Abirached recounts it all. I have read several great graphic novels depicting the struggle of peoples living through various types of war or oppress Zeina Abirached uses graphic images to tell her story about growing up in war-torn Beirut during the 1980s. Focusing on war’s impact, Abirached provides the reader with glimpses of every-day life and the effect war has on the ordinary citizen. From the water and electricity shortage, to the road closures, to her mom's bullet-ridden navy blue Renault, Abirached recounts it all. I have read several great graphic novels depicting the struggle of peoples living through various types of war or oppression. In comparison, I found this text rather repetitive and the story lacking in depth. That said, the book was written to simply record the author’s memories of her childhood. This she did. If one is interested in reading graphic novels that deal with peoples experiences during times of war or oppression I would recommend Persepolis: The Story of a Childhood by Marjane Satrapi, Auschwitz by Pascal Croci and Palestine by Joe Sacco. I found these books to have a more interesting storyline and enticing graphics. Certainly not as inspiringly tight as A Game For Swallows, but still very solid. Abirached continues to reveal the every day life of a kid growing up in Lebanon during the war. While I have read some reviews that criticized I Remember Beirut and A Game For Swallows for being too similar, but i would like to bring to your attention at least one key difference. This book is much more child focused. Rather then spending equal attention on the struggles of the adults around her and the struggles of Certainly not as inspiringly tight as A Game For Swallows, but still very solid. Abirached continues to reveal the every day life of a kid growing up in Lebanon during the war. Beautiful graphic novel that remembers me of Persepolis. The history of the Lebanese civil war seen through the eyes of a little girl who tells it with magnificent illustrations. Touching and funny at the same time. Proprio bello questa graphic novel che non puó che ricordarmi Persepolis. La storia della guerra civile libanese vista dagli occhi di una bambina che la racconta con delle magnifiche illustrazioni. Toccante e divertente allo stesso tempo. THANKS TO NETGALLEY AND LERNER PUBLISHING GROUP Beautiful graphic novel that remembers me of Persepolis. The history of the Lebanese civil war seen through the eyes of a little girl who tells it with magnificent illustrations. Touching and funny at the same time. En pysty olla vertaamatta Marjane Satrapiin vaikka Satrapi kertookin Iranista ja Abirached Libanonista. Pidän Satrapista enemmän, mutta ei ollut huono tämäkään. this book is really well written. the art is very similar to that of Persepolis. when i read this i find that it transitions very well as if i were thinking and seeing it in my mind. this book demonstrates how children of Beirut coped with growing up in the middle of a war they were born into. though the art isn't very detailed it still was more than enough to keep you interested. i recommend this book to anyone regardless of your interests because it is a very adaptable and well built book. Brilliant illustrations, excellently done. Abirached was born two years before me. Even though this book illustrates exactly how horrifying war can be, I found it interesting that Abirached and I still had some of the same memories. The repetitiveness and rhythm of this book, coupled with it's brevity, make it a quick, easy read. This is a perfect choice for a history student and, of course, for anyone who can appreciate a tough, but beautiful, story. this was an ok book. it did not really click with me and my reading likening. i still thought it was a good book it has a lot of info in this book. i gave it a 3 star rateing because it was good but it i did not click with it. i reccemend this book to people who like a good family book to read. graphic novel format really helped emphasize piecemeal memories that the author had of a childhood during war. loved the black and white illustrations (very bold lines). This book was another quick read! I liked the black and white simplistic art style. However, I was pretty confused for most of this book and found it hard to connect with the characters. I didn't find this as engaging as her other book as this was more of a list than an actual narrative, but it was still pretty good. Hieno sarjakuva lapsen elämästä sisällissodan kuohuissa. Mustavalkoiset, yksinkertaisen graafiset kuvat olivat vahvoja ja tekivät vaikutuksen. I read this the day after I finished A Game for Swallows by Abirached, and was pleasantly surprised by the difference in tone. She uses the same black and white style that reminds so many of us of Persepolis, but instead of describing a night of suspense and worry and comfort as she did in her other graphic novel memoir, she describes the humdrum of daily life in Beirut. She offers memories of the bullet-ridden cars, of her brother's shrapnel collection, of the long lines at the market. When I read this the day after I finished A Game for Swallows by Abirached, and was pleasantly surprised by the difference in tone. She uses the same black and white style that reminds so many of us of Persepolis, but instead of describing a night of suspense and worry and comfort as she did in her other graphic novel memoir, she describes the humdrum of daily life in Beirut. She offers memories of the bullet-ridden cars, of her brother's shrapnel collection, of the long lines at the market. When war is your reality, you make the best of it--and that is what the Abirached family did. There are always precautions to take, as well as other safety measures such as hanging black-out curtains on the window. But that didn't stop them from carrying out their lives as best as they could in the ways that they were able. Overall, this is a great look into a different culture for a more personal view of its history. I'd definitely recommend this for graphic novel lovers--it's truly something special. “I don't remember the last day of the war.